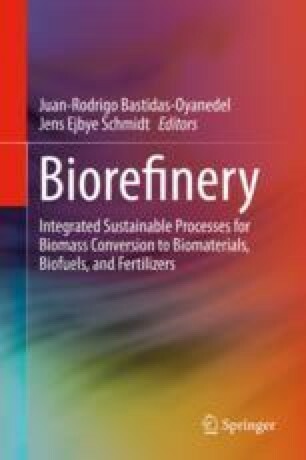 Seawater-based pretreatment of lignocellulosic biomass is an innovative process at research stage. With respect to process optimization, factors affecting seawater-based pretreatment of lignocellulosic date palm residues were studied for the first time in this paper. Pretreatment temperature (180–210 °C), salinity of seawater (0–50 ppt), and catalysts (H2SO4, Na2CO3, and NaOH) were investigated. The results showed that pretreatment temperature exerted the largest influence on seawater-based pretreatment in terms of the enzymatic digestibility and fermentability of pretreated solids and the inhibition of pretreatment liquids to Saccharomyces cerevisiae. Salinity showed the least impact to seawater-based pretreatment, which widens the application spectrum of saline water sources such as brines discharged in desalination plant. Sulfuric acid was the most effective catalyst for seawater-based pretreatment compared with Na2CO3 and NaOH. This work was supported by Cooperative Agreement between the Masdar Institute of Science and Technology (Masdar Institute), Abu Dhabi, UAE and the Massachusetts Institute of Technology (MIT), Cambridge, MA, USA—Reference 02/MI/MI/CP/11/07633/GEN/G/00.